PlayAmo offers its players a number of top quality promotions every week with a special something for the weekend. If you like online pokies, this is the post for you! Get ready for weekends with an excellent match deposit bonus offer along with a large number of free spins. Boost your casino account with the free spins and match deposit bonus offer at PlayAmo Casino. After a long week, Friday is a great day for more casino fun. Kick the weekend off with free spins on The Golden Owl of Athena slot game. 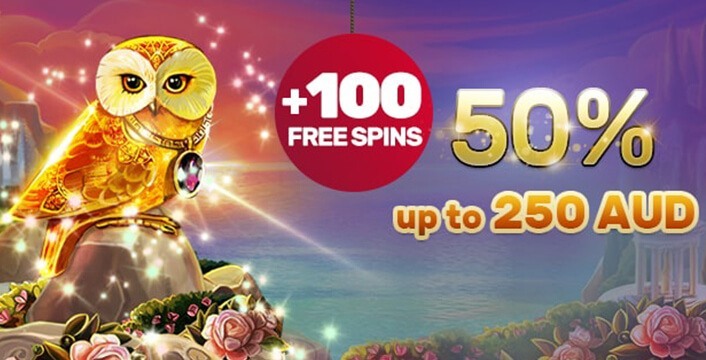 Start off with a 50% match deposit bonus up to $250 and get 100 free spins on The Golden Owl of Athena slot. Redeem this offer with the RELOAD coupon code when making your deposit. Make sure you have a real money casino account at PlayAmo Casino. Go to PlayAmo Casino’s promotions page. Click on the GET BONUS button. Make sure to click on the “I’ve got a bonus code” button. Enter the RELOAD coupon code. Make a minimum deposit of US $20. 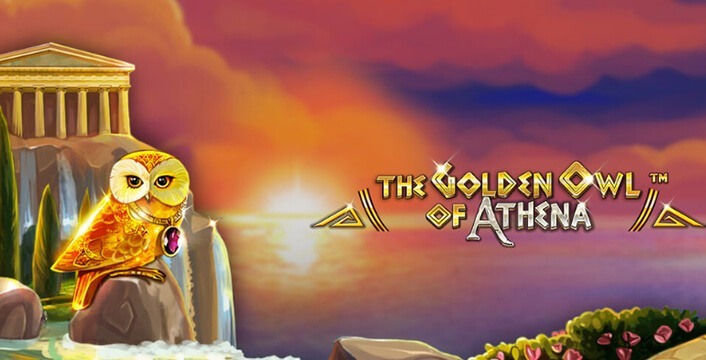 The casino awards you with the 50% match deposit bonus and 100 free spins on The Golden Owl of Athena. Claim this offer every Friday this month using the RELOAD coupon code. The Golden Owl of Athena free spins offer divides the 100 spins into two. into two. The casino adds the first 50 free spins to your account 24 hours after your deposit. After another 24 hours, you get the next 50 free spins. Make sure to wager the deposit amount 1x in order to receive the free spins. Free spins winnings come with a 50x play through requirement. When you wager the match deposit bonus funds, the biggest bet amount in one go is $5. The Golden Owl of Athena is a popular slot created by Betsoft Gaming. Go on a journey back in time to Ancient Greece where you seek rewards along with the Golden Owl . The game’s music and icons help set the scene in Ancient Greece. There are five reels and three rows with 10 pay lines. The game includes free spins, scatter wins, wild substitutes and more. Symbols on the reels include Athena, and other Ancient Greek symbols such as a helmet and a goblet amongst others. There are also lower paid card symbols J, Q, K, and A.
Scatters pay wherever they land on the reels. As expected, the Golden Owl is the wild. This symbol substitutes for all other symbols on the reels, helping create bigger and better wins. The owl symbol acts as both a scatter and a wild. Free spins scatter owls have the words “Free Spins” across the front. Trigger free spins rounds when three or more Golden Owl symbols appear on the reels. Three owls trigger eight free spins, four trigger 12 free spins, and five owls trigger 20 free spins. During free spins rounds, Athena swoops in and takes over. The owl anoints one of the symbols randomly, and that symbol expands to fill reels during the free spins rounds. The expanded symbols award bonus stacked wins when they expand on the reels. The Buy Feature is an excellent special feature giving you more control over your slots destiny. If you wish to spin the reels and wait for the lucrative free spins round to trigger, go ahead. If you want to play free spins instantly, simply use the Buy Feature. This feature allows you to purchase a free games round. You get 20 free spins in your purchase. When playing the free spins, the bet per spin is the same as it was before purchasing the free spins. If you wish to play the free spins at a higher bet per spin, this is possible. Simply choose a bigger line bet before purchasing the free spins round. The cost of the free spins round changes according to the wager per spin. The Double Up feature, also known as the gamble feature, gives you a chance to add excitement to your wins. When you win, you can select the Double Up feature and wager either your entire win or half your win. Simply pick the Gamble All button or the Gamble 50% button. Once you have selected your gamble choice, pick either Heads or Tails. If you win, you either double your winnings or double half your winnings according to your selection. If you lose on Gamble All, you lose all.